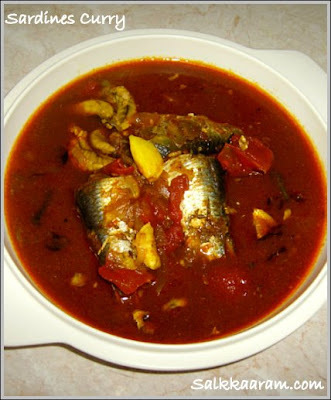 Meen Mulakittathu / Spicy Red Fish Curry | Simple and Delicious ! This curry is good with Kappa/Tapioca, Rice, Rava Upma, Dosa etc.People from different places in Kerala cook this curry using various methods. Some uses chopped onions and adds ginger also. Mathi mulaku curry is the common dish in most of the houses in our place. They make it every day! 1)Soak tamarind in hot water and take the paste of about one tea cup. 2) Add another 1 1/2 cups of water. 3) Put all the powders, finely chopped or ground onion, tomato, salt, crushed garlic into it. 4) Cook till little thick. 5) Add sardines and cook till done. 6) Add curry leaves and green chillies. 7) Pour coconut oil and remove from fire. oh wow! where di u get matthi from? is it fresh or canned? Shaheen, it is fresh.Here, it is easily available. u get fresh mathi? we get all other fresh fish except mathi in atlanta. i like mathi mulakushyam and mathi fry too...the pic is good.thanks seena. Hey Maneka, Am in Dubai..I too love all Mathi vibhavangal.. I agree with you Reena,it is the one fish which tastes good in all forms. I think you all get mathi only when visit India? i love cooking nd ur recipes r superb.iam a recent visitor thanx. thanks for the nice comment.. :) Hope to see you again.. I am afraid that 2 tsp of red chilli, and 1 lemon sized ball of tamarind would be slightly higher than what is adequate for 6 sardines! Insted of putting a raw tomato,put tomato puree or paste .this will thiken ur mulakittathu and it will taste good.And also insted of tamarind,you may add kodampuli.It is more healthy and teasty.